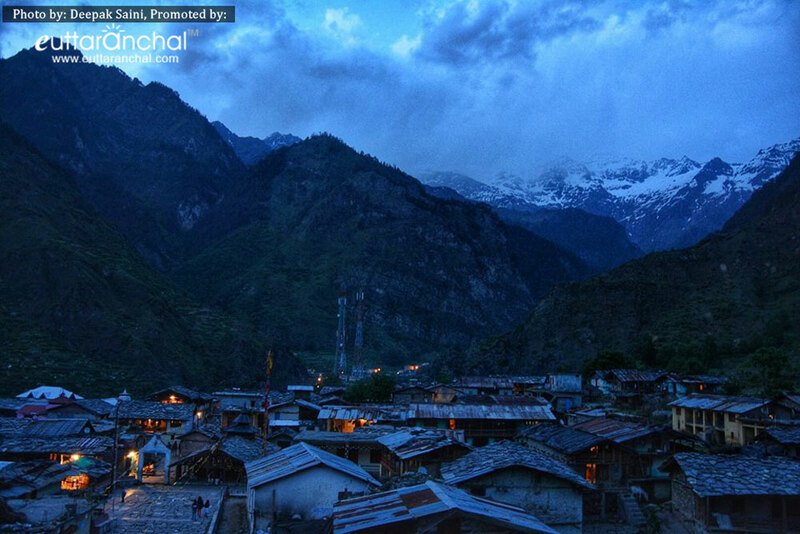 The untouched village of Kharsali also known as ‘Khushimath’ is cradled with love in the Uttarkashi district of Uttarakhand. It is perched at an astounding elevation of 2,675 metres above sea level. The tiny hamlet of Kharsali has a religious significance as it is the winter seat of Goddess Yamuna. Since the Yamunotri shrine becomes inaccessible in winters, due to heavy snowfall, therefore, the deity is brought here for worshipping. Kharsali is known as the home of Goddess Yamuna during winters when the Yamunotri Shrine becomes inaccessible due to heavy snowfall. Kharsali also houses the oldest Shani Dev Temple of India; the idol of Goddess Yamuna is kept at the Shani Dev Temple during the winters. The sleepy town of Kharsali has a divine aura as it is one of the best places to head to if you want to enrapture in spirituality. One of the popular attractions of this village is the oldest Shani Dev Temple of India, where the idol of Goddess Yamuna is kept during winters. The temple exhibits its unique lustre in the form of its remarkable ancient architecture that has defeated the waves of the times. One must not miss this temple as it is made of stone, wood and a mortar created from the Urad dal or Black gram pulse. Village Tourism: Kharsali village, which is situated near Jankichatti, is a hushed and sleepy hamlet which is far away from the hustle-bustle. Tourists can explore the beautiful natural surroundings and learn about the culture, customs and traditions of hill folks. Camping: Camping at Kharsali with friends is an amazing experience for the adventure seekers. Bonfire at night just adds to the camping flavor. One can lay under a clear night sky with a cup of coffee. For pilgrims and tourists visiting the Yamunotri shrine, Kharsali can be a place to visit and relax after partaking in the arduous pilgrimage. It is just 1 km from Jankichatti (base camp for Yamunotri temple trek). May-June and September-November are the best months to visit Kharsali as during these times, nature is in its full glory. Many reasonable priced and luxury hotels are available at Kharsali, with the facility of Helicopter bookings from Dehradun and Char Dhams. Luxurious camps are also available at Kharsali. You can check more places to stay at: Hotels in Barkot. Spreading the hues of its stellar beauty to the zenith, the tiny village of Kharsali has legends and myths associated with it. The locals believe that one of the famous religious attractions, the oldest Shani Temple adorned at Kharsali was built by the Pandavas. There is a ritual of worshiping the idol of Goddess Yamuna on every 'Bhai Dooj' or ‘Yama Dwetiya’ at Kharsali which is also winter seat of Goddess Yamuna. Surprisingly, it has withstood the earthquakes and the other natural calamities since ages. Another popular attraction of Kharsali is the ancient Lord Shiva temple, where Shiva is depicted in his Someshwar avatar. Apart from this, you can also admire the natural thermal springs of Kharsali. Visiting Kharsali has now become easier than before as the government has decided to keep open the Char Dham Yatra during winters, devotees can worship Goddess Yamuna at Kharsali during the winters. What is Kharsali famous for? Kharsali is famous among tourist as Yamunotri Winter Seat. Kharsali is recommended destination for Foreigners, Solo. Kharsali is popular destination for following activities/ interests - Char Dham Route, Pilgrimage, Temples, Winter Char Dham. Travelling to Kharsali in 2019? Contact us for planning your Kharsali tour with best travel packages of as per your requirements!